A non-profit foundation has named the Seven New Wonders of the World at a ceremony in Lisbon, Portugal. 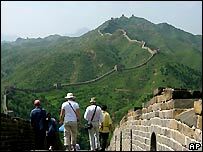 The Great Wall of China, Machu Picchu in Peru, Brazil's Statue of Christ Redeemer, the Colosseum in Rome and Jordan's Petra all made the list. The Mayan ruins at Chichen Itza in Mexico and India's Taj Mahal were also picked, but England's Stonehenge and the Eiffel Tower in Paris missed out. Organisers say about 100m people cast votes over the internet and by phone. The New7Wonders campaign is the brainchild of a Swiss man, Bernard Weber, who has had a varied career as a film-maker and museum curator. American actress Hilary Swank said at the presentation ceremony: "Never before in history have so many people participated in a global decision." Organisers say the contest was a chance to recognise the achievements of societies outside Europe and the Middle East. 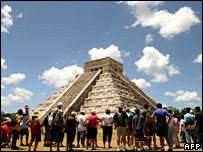 The original list of seven wonders was established more than 2,000 years ago by Greek scholars. It included the Hanging Gardens of Babylon, the Colossus of Rhodes, the ancient lighthouse outside Alexandria, the great pyramid at Giza - the only survivor - and three other long-vanished edifices. The campaign has been some six years in the making. But the United Nations Education, Scientific and Cultural Organization (Unesco) - which has long had its own World Heritage List - has criticised the organisation's approach. Unesco argues that the list is very limited. Its own World Heritage List numbers sites including 660 cultural and 166 natural. Success in the competition will not be popular with everyone. Archaeologists said the Mayan ruins, at Chichen Itza in south-eastern Mexico could be hit by an avalanche of additional visitors and that the extra wear and tear could force authorities to limit the tourist traffic. More than a one-hit wonder?